We were delighted when Splash About contacted us about a possible review opportunity. Mr J is a very keen swimmer and taking the children swimming regularly is something we're agreed on. For me, it's because I'm such an unconfident swimmer which means I don't want my children to have the same fate. Splash About is a great website as it offers information and advice as well as a great shop which provides a great choice for swimming home or abroad with children. We were sent the BabyWrap and a beach ball to try out. I was really pleased to be able to test them out as they were both things that we needed to make the swimming experience more enjoyable for the boys. Unfortunately, the swimming pool doesn't allow photography. So you'll have to bear with our words. The boys love swimming. It's taken us a while to make it work given we have three under-4. Having Squeaks learn to swim has made things much easier, she's happy to play in the children's area and practice her diving and seeing how much she can soak everyone as she kicks her legs. For the boys we have bought float jackets which has boosted confidence no end which means we have three happy children in the swimming pool. We also discovered a local private pool which means they are happy for us to have three children with us. We'll be ok in the leisure centre from March, but to be honest I think we'll stick with this pool as the children's pool is so good. The one thing which has slightly scuppered our enjoyment in the pool is Tiny getting cold. It's quite an odd thing to see a child laughing with teeth chattering, especially because he then starts crying and maybe having a tantrum the minute we try to leave. The BabyWrap from Splash About it the ideal solution. The BabyWrap is made from neoprene (the same material as wetsuits) so it has certainly done it's job in stopping Tony's teeth chattering. The BabyWrap is also a great design. First and foremost the velcro fastenings mean they're not being undone. The boys have tried a version in the past- and spent the whole time undoing themselves from it due to the positioning of the fastenings. With the BabyWrap the fastenings are extra wide and take more effort to get undone. Plus, unlike other versions, there's no easy place for little fingers to start and gain reward. 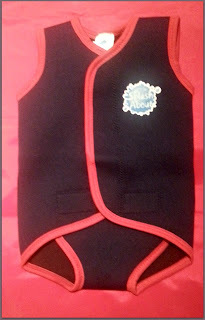 For comfort the seams are flat, so there's no digging in to baby soft skin. And for us the added benefit is that with a little maneuvering we managed to fit Tiny's float jacket over the top. The BabyWrap does allow us to stay in the pool longer. These are great for babies, the texture allows you to hold your child securely, and keeps babies warm where the temperature can be variable. And you can tell the difference it makes- hug you child after you've removed the BabyWrap and feel how warm they are compared to you! The beach ball, as described, really is perfect for little hands. It is quite a small ball which means it's perfect for the swimming pool. No-one minded it being thrown around, in fact there was another ball in the pool, with a tougher outer, and that would be one of the benefits of taking a 'beach ball' into the pool, it's not going to do anyone an injury. The beach ball is a little tougher than beach balls as I remember them. This will be taken on all trips to the pool, the boys loved it, and didn't want to be parted from it once the session was over. Splash About offer great choice, and great value for money. The website clearly demonstrates the differing benefits of its products, and gives a good understanding of products by age group. Both of these items have made swimming a more enjoyable experience. Disclaimer: We received a BabyWrap and beach ball for the purposes of this review. All views contained are our own.